What I've always admired in Richard Herring's comedy is his sheer delight in goading the audience as much as he seems to enjoy making them laugh. And, anyone making the assumption that growing a "Hitler moustache" is disrespectful and distasteful are, arguably, correct. But you will have entirely missed the point. Were it not for that nasty fascist dictator stealing all the comedic joy from the moustache, it would almost certainly still be adorning the lips of thousands of men across the world today. Herring plays with his audience with an early aside, asserting that this was "possibly Hitler's greatest crime." Herring loves to skate the narrow line between an audience responding in riotous laughter and "Ooh, now that's too far." Discussing the first week in which he ventured out of the house with the tache last summer, he feared jibes and possibly even physical abuse. Instead, he was met with widespread indifference, save a few teenagers' sneers. He was both shocked and delighted by the British public's reserve, and even some of his own friends thought it too impolite to mention his nervous breakdown. Tackling racism head on, Herring is keen to make it clear he is a fluffy liberal, a message his army of intelligent fans do not need hammering home quite so much. He appears almost desperate at times to ensure his audience has not mistaken his show for a BNP rally, spending a good portion of the act ripping the false ideals on a BNP leaflet to shreds. Given a late billing at Baby Blue at the Albert Dock, and an even later start of 10pm, Herring was rushing through his hour and a half of material as a restlessness grew amongst the crowd. This was a disappointment, and I hope any first timers to Herring's work are encouraged to seek out his impressive back catalogue spanning 25 annual Edinburgh festival performances. Herring has donned the square inch of facial hair and, with it, all its "evil" connotations, since his Edinburgh Fringe show last August. In coming to this week's Liverpool Comedy Festival, he told us, with a palpable sense of relief, he was laying the show to rest and finally shaving off his "nasal welcome mat." He is a fine-tuned, sarcastic, quick-witted pro and, having first seen this show in its infancy last August, I can do nothing but applaud him for sporting a full on Hitler tache for the past ten months in the name of proving a point, which, he admits, is a rather glib one. 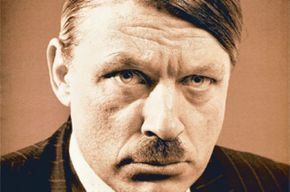 Surely Herring cannot genuinely believe this ridiculous moustache may have thrived were it not for Adolf? After an hour with Herring, it doesn't matter, you've been laughing so much you no longer care. But this particular show is tinged with serious message, and Herring lays his heart bare to the crowd, in spite of his familiar arrogant stage persona. He is passionate about equality, the vote, Britain's glorious right to free speech and, ultimately, our right not to be judged whilst going about our daily lives, whether it's with a Hitler tache on your face or not.